A generous bequest from long-time donor Rose Shure has been dedicated to CCH’s HomeWorks campaign, which advocates for housing and better school services for homeless families. “While she was never homeless as a child, Rose rose out of poverty because her family stressed the value of education above all else,” said niece Barbara Levie. The chairman of Shure Microphones, Mrs. Shure died two years ago at age 95. Mrs. Shure supported CCH personally and through her company for 24 years, culminating in a recently received generous bequest. Humble beginnings made her sympathetic to the work of Chicago Coalition for the Homeless, her family tells CCH. Rebecca and Israel Langer, her parents, fled the Ukraine in 1917 to escape escalating anti-Semitic pogroms. Though they spoke no English, they felt their best hopes for a better life lay in America. Their journey ended in Dubuque, Iowa. Despite a meager income, the Langer family lived with optimism because their children had access to an excellent education, which they prized above all else. When she graduated from high school, Rose was co-valedictorian of her class. All three Langer children would go on to college. After graduating from the University of Iowa with a degree in business, Rose moved to Chicago in 1949. She took a job as an administrative assistant to Sidney Shure at Shure Brothers, Inc. At that time, the company was already the largest maker of phonograph cartridges in the U.S.
Shure became an industry leader, renowned for the quality and durability of its microphones. As the company points out: When Dr. Martin Luther King, Jr. delivered his “I Have A Dream” speech, he was speaking into a Shure microphone. When the U.S. Postal Service created its first Elvis Presley stamp, he was depicted with a Shure 55SH mic in his hand. Roger Daltrey, lead singer of The Who, would twirl the Shure SM58 around his head like a lasso. Shure microphones have been on the lectern of every U.S. President since FDR. 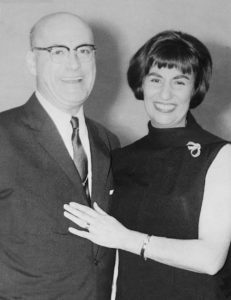 Rose and Sidney fell in love and married in 1954. “Uncle Sid saw Aunt Rose as his equal. Intellectually, they were partners; a perfect match,” said her niece. After Sidney passed away in 1995, Rose succeeded him as company chairman in a seamless transition. Shure continued to expand product lines and under Mrs. Shure’s leadership, the company expanded. Rose led the company until her death, at age 95, in January 2016. CCH is incredibly privileged to carry on the advocacy of HomeWorks in Rose Shure’s memory. We hope this connection to improving the lives of homeless students and their families brings comfort and satisfaction to all those that knew and loved her.